There is no difference between quartz and Silestone countertops. Silestone is merely a brand name for countertops made out of quartz. Quartz countertops offer several desirable benefits to consumers who choose to have them installed. Not only are quartz countertops some of the most durable countertops on the market, they are also some of the most heat, freezing and corrosion resistant. Because they are non-porous, quartz countertops are also resistant to staining and bacterial growth. Quartz is one of the hardest materials used to fabricate countertops. On the Moh's scale of hardness, quartz is ranked a seven which makes it harder than granite, which is ranked a six. Perhaps the biggest drawback associated with quartz countertops is their high price tag. This type of countertop can cost $50 and $90 per square foot, installed. Installing quartz countertops requires expertise and man-power. Because they are so heavy and difficult to maneuver, it is recommended that quartz countertop installation be left to experienced professionals. 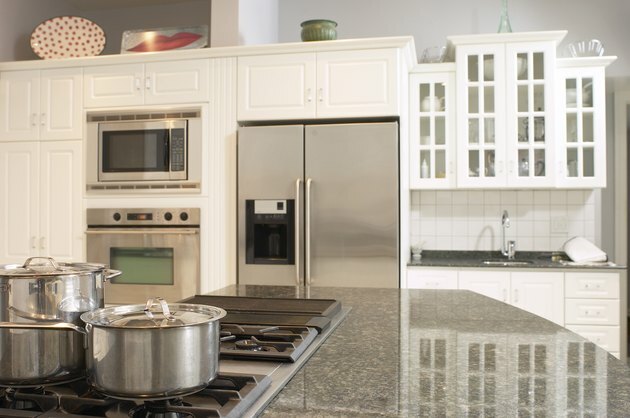 Quartz countertops are relatively easy to clean and maintain. The can be cleaned with regular household chemicals. Since they are non-porous, they do not need to be regularly sealed like other types of countertops. Why Does My Granite Vanity Get Dark When It's Wet?